The Florida SBDC at University of West Florida brings comprehensive business consulting to all Navarre Chamber Members at no cost in Navarre. NO APPOINTMENT IS REQUIRED! Bring your small business questions!! 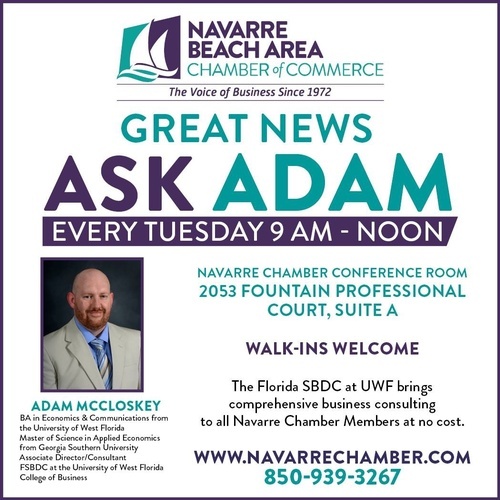 The "Ask Adam" Consulting Series is every Tuesday at The Navarre Chamber Office, 9 am-Noon. It is a very informal setting and members can walk-in to the meeting anytime between 9 am until Noon to ask any business related questions. More in depth consultations can be scheduled with Adam on Tuesday afternoons. Adam McCloskey is an Associate Director/Consultant with the Florida SBDC at the University of West Florida. He has a BA in Economics and Communications from UWF and a Master of Science in Applied Economics from Georgia Southern University.